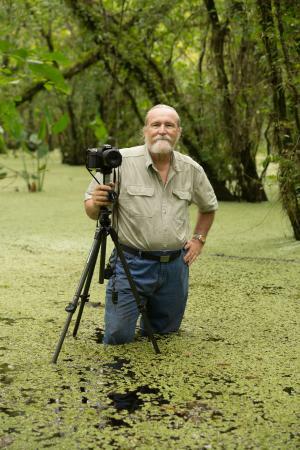 February 12, 2019 - 7 p.m. - 8 p.m.
will present his program on “Florida’s Wild Orchids.” Roger has photographed 96 of Florida’s 109 native orchids and discovered two species new to the flora of Florida. Florida Native Plant Society state conferences and the 2008 World Orchid Conference in Miami. He is an avid long-distance solo canoeist, kayak-fishing enthusiast, wildflower photographer, and birdwatcher. He has authored numerous books and field guides, including: Florida Keys Wildflowers, Everglades Wildflowers, Central Florida Wildflowers, Complete Guide to Florida Wildflowers, Exploring Everglades National Park, and Attracting Hummingbirds and Butterflies in Tropical Florida. Currently, he is the survivalist instructor for the Discovery Channel’s reality television show Naked and Afraid. Roger grew up in Cocoa Beach and moved to Homestead, Florida after being Honorably Discharged from the Army in 1968 as a tank gunner. He and his wife, Michelle, live in Homestead. Seating is limited, so Come Early! Take some time to browse through Roger’s books that will be for sale, have him sign your copy, chat with him, and be prepared to be entertained and educated by a thoroughly knowledgeable and dynamic speaker. Mangrove Chapter meetings are held at Lemon Bay Park, 570 Bay Park Blvd. in Englewood, Florida with speakers beginning at 7:00 p.m. Doors open at 6:15 pm. The evening promises to be informative and inspiring with plenty of time for comments, questions, lots of good discussion, and snacks. We encourage Floridians and our winter visitors to learn more about the importance of Florida’s native plants and communities by becoming a member of the Mangrove Chapter of the Florida Native Plant Society. For more information about Mangrove Chapter activities and events, please visit mangrove.fnpschapters.org. FNPS is a nonprofit organization whose mission is the preservation, conservation, and restoration of the native plants and native communities of Florida. The Mangrove Chapter, Florida Native Plant Society will hold its 16th Annual “Plant Native” Day on Saturday, March 9th, 2019 from 9:30 a.m. to 1:00 p.m. at Cedar Point Environmental Park, 2300 Placida Road, Englewood, FL. This half-day event is free and open to the public. The theme of this year’s event is “SHADE: Planting for it & Planting in it”. Learn about the various native trees, palms and shrubs that can be used to create shade in your sunny yard. Find out which native shrubs, ferns, groundcovers and wildflowers do well in a shady landscape. The guest speaker is Laurel Schiller, Florida Native Plants, Inc., Sarasota, Florida. She will use live plants to demonstrate her lectures, which take place between 10:00 a.m. and Noon. Her nursery plants will be offered for sale, beginning at 9:00 a.m., outside the Environmental Center during the day’s program. Mangrove Chapter members will also be offering their home-grown native plants for donations out in the Native Plant Demonstration Garden. The Peace River Butterfly Society is also participating in the event, with their monarch-raising paraphernalia, as well as nectar and larval host plants for sale at their booth. Additionally, educational handouts will be available, a light refreshment will be served and the program will be followed by a choice of a Garden Tour or Guided Trail Walk. For more information, contact Cedar Point Environmental Park at 941-475-0769.